Following the previous post, it is only appropriate to do a cross-country comparison of per capita income. As has been pointed out in numerous research articles and the media, income growth in China and India has been nothing short of phenomenal in the last decade. However, income levels of these economies are still relatively low. 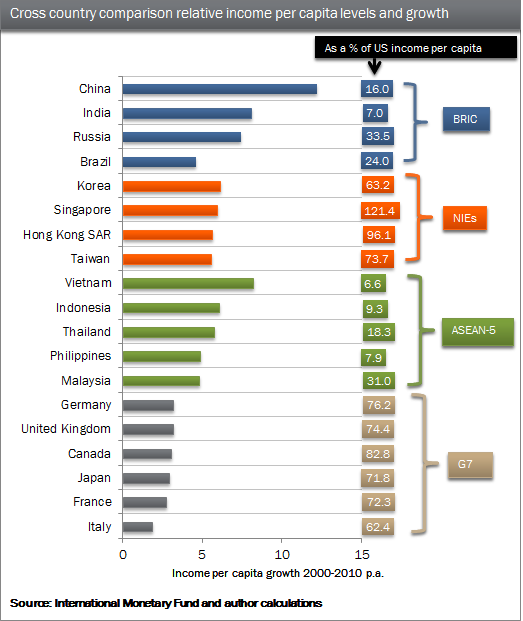 In comparison, Malaysia's income level is one of the highest amongst the ASEAN-5 and BRIC economies, but growth has been relatively slow.